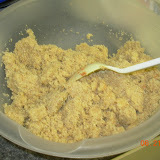 In a bowl, place bulgur wheat with 2 cups boiling water to cover. Allow to sit for about 15 minutes. Saute the onion with 1 tbsp olive oil until golden brown. Put 2 tbsp tomato paste and cook for 1 more minute. Add it to bulgur and mix them very well. Combine with the tomato paste and olive oil left. Add the veggies, herbs and spices. Serve with grape leaves or romaine lettuce leaves.